Audio Record Wizard is designed for recording from sound card, so its capability partly depends on the sound hardware and its driver. You may have many media devices on the computer, like on-board sound card, USB audio device, external sound card. and every media device may provide many recording devices, like microphone, line-in, stereo mix. Familiarize yourself with them(read their document if necessary), then you will be able to take full use of the audio recorder software. Note - Names for devices are provided by its manufacturer, so different sound cards have the different names. If you are not sure which device should be selected, you may need to do some test recording to see if it is the right device. ... used for recording from microphone. ... used for recording from Line-in jack. External audio devices (e.g. tape player) can be recorded in this way. Before we start recording, we need to make sure that Audio Record Wizard is set up the way we want it. 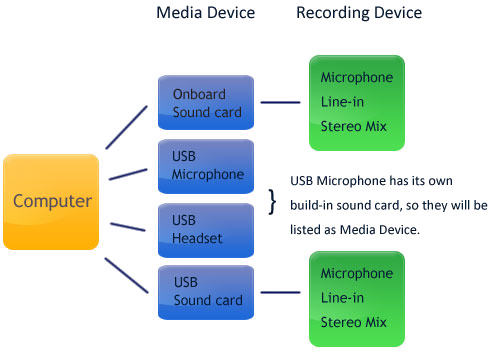 Here is an example, we would like to record from microphone which is connected to the on-board sound card. 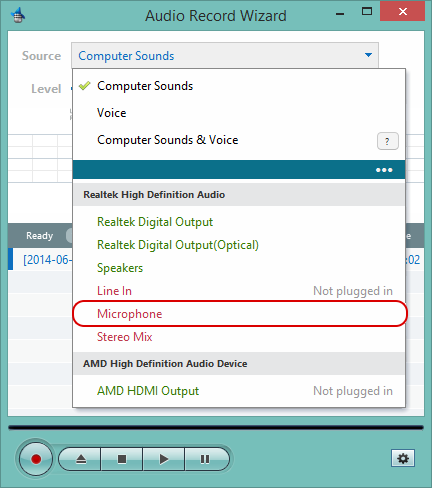 In this example, the on-board sound card is "Realtek High Definition Audio", so select "Microphone" within "Realtek High Definition Audio" section. What it can do ?